BCDB Rating: "Lookin' For Love In All The Wrong Barrels" has not yet received enough votes to be rated. This page has been viewed 15 times this month, and 1226 times total. Cartoon Characters: Flapjack, Woman in Attendance, Captain K'nuckles, Bubbie, Peppermint Larry, Suave Man, Man in Attendance, Justice of the Peace, Flirtatious Lady, Gertrude, Tickled Lady, Crying Sailor, Nostalgic Sailor, Pufus, Muscle Man, Glue Shop Man, Dock Hag, Candy, Sailors, Men. Vocal Talent: Thurop Van Orman (Flapjack, Woman in Attendance), Brian Doyle-Murray (Captain K'nuckles), Roz Ryan (Bubbie), Jeff Bennett (Peppermint Larry, Man #1, Sailor, Suave Man, Man in Attendance), S. Scott Bullock (Sailor, Justice of the Peace), Grey DeLisle (Flirtatious Lady, Gertrude, Tickled Lady), Steve Little (Man #1, Crying Sailor, Nostalgic Sailor), Richard McGonagle (Pufus), Daran Norris (Muscle Man, Glue Shop Man, Dock Hag), Kevin Michael Richardson (Candy). Directed By John McIntyre (Supervising Director). Produced By Pernelle Hayes (Line Producer). Executive Producers: Brian A. Miller, Jennifer Pelphrey, Mark 'Thurop' Van Orman. Written By Jackie Buscarino, Steve Little. Created by: Mark "Thurop" Van Orman. Creative Director: J. G. Quintel. Story Editor: Kent Osborne, Steve Little. Character, Prop, and Effects Design: Thaddeus Paul Couldron, C. Raggio. Character, Prop, and Effects Design Clean-Up: Erik Elizarrez. Background Painters: Chris Roszak, Jonny Van Orman. Casting and Voice Direction: Charlie Adler. Recording Studio Manager: Karie Gima Pham. Director Production Technology: Antonio Gonella. Post Production Sound Studios: Sabre Media Studios. Supervising Sound Editor: Jeff Hutchins. Re-Recording Mixers: Eric Freeman, Timothy J. Borquez, C.A.S. Post Production Supervisor: Tony Tedford. Post Production Coordinator: Alicia Parkinson. Machine Room Operator: Chris Hoetger. Animation Checking: Sandra Benenati, Vicki Casper. Track Reading: Slightly Off Track. Overseas Production Facility: Saerom Animation, Inc.
Stop Motion Sequences: Screen Novelties. Production Coordinators: Stephanie Lesniak, Scott Malchus. Executive in Charge of Production for Cartoon Network: Jeff Prezenkowski. © 2008 The Cartoon Network. Do you have anything to add to this page? Have we made any mistakes... or do you have any additional information about Lookin' For Love In All The Wrong Barrels? If so, we would love to hear from you. Please send us a quick note with your additions or corrections to this page, and we will make the corrections as soon as possible! 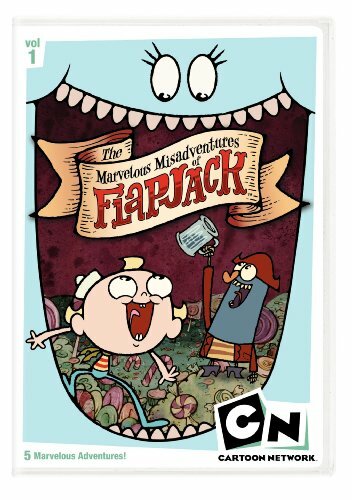 Flapjack helps a lonely K'nuckles find love. Do you love Lookin' For Love In All The Wrong Barrels, or do you think it is the worst cartoon ever? Let us know what you think! Surely you have an opinion... so share what you think. Take a minute and post your own comments about this cartoon here. Lookin' For Love In All The Wrong Barrels by Big Cartoon DataBase is licensed under a Creative Commons Attribution-NonCommercial-ShareAlike 4.0 International License.